Consuming your calories in liquid form is generally not considered to be a great strategy for most people in a calories deficit. Why? Because liquid calories are less likely to fill you up. So within a short period of time you could be feeling hungry again. That could mean you reach for the cupboards, have a few treats you shouldn’t and go way over your calories. But, there are situations where drinking your calories is a good strategy. For instance, if you don’t have a problem with feeling hungry during the day, then a delicious smoothie can be tasty and refreshing. Also, if you’re not a fan of eating a ton of fruit and veggies, then blending them all up in a smoothie can transform the taste. And if you’re on the move all the time, you can have that smoothie with you and drink it on the go. Lastly, you can make use of that smoothie maker that’s gathering dust in the back of the cupboard. So, read through the recipes below, get blending, and start maxing those micros! Wash and prepare all the fruit and vegetables. Place all the ingredients in a high-speed blender and blend until smooth. Slice the banana and place it in a high speed blender or food processor, along with the frozen raspberries, milk and chia seeds. Blend until smooth. Serve immediately in a bowl with your favourite toppings. 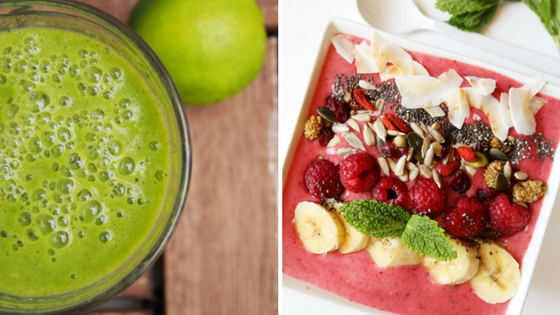 Great smoothies are one thing, but is your nutrition plan set up to bring you results? If you need some help optimising your nutrition and you fancy some some free advice from me, then take a look at my ‘7 Steps to Get Lean’ online workshop. This online workshop will give you all the information you need to lose fat and build muscle, whatever your circumstance. And you can grab your free spot by clicking on the image below.